Drawing on extensive interviews with the late actress and other film industry professionals, this book surveys the work of performer, director, and producer María Elena Velasco and her central place in Mexploitation cinema. La India María—a humble and stubborn indigenous Mexican woman—is one of the most popular characters of the Mexican stage, television, and film. Created and portrayed by María Elena Velasco, La India María has delighted audiences since the late 1960s with slapstick humor that slyly critiques discrimination and the powerful. At the same time, however, many critics have derided the iconic figure as a racist depiction of a negative stereotype and dismissed the India María films as exploitation cinema unworthy of serious attention. By contrast, La India María builds a convincing case for María Elena Velasco as an artist whose work as a director and producer—rare for women in Mexican cinema—has been widely and unjustly overlooked. 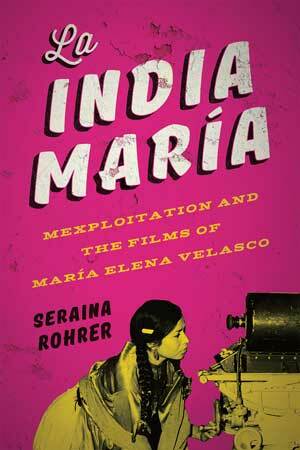 Drawing on extensive interviews with Velasco, her family, and film industry professionals, as well as on archival research, Seraina Rohrer offers the first full account of Velasco’s life; her portrayal of La India María in vaudeville, television, and sixteen feature film comedies, including Ni de aquí, ni de allá [Neither here, nor there]; and her controversial reception in Mexico and the United States. Rohrer traces the films’ financing, production, and distribution, as well as censorship practices of the period, and compares them to other Mexploitation films produced at the same time. Adding a new chapter to the history of a much-understudied period of Mexican cinema commonly referred to as “la crisis,” this pioneering research enriches our appreciation of Mexploitation films. Rohrer heads the Solothurn Film Festival, one of Switzerland’s leading cultural events. She holds a PhD in film studies from the University of Zurich and has been a visiting scholar at the Chicano Studies Research Center of UCLA, where she conducted her research for this book.